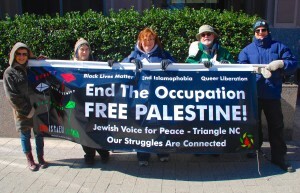 Jewish Voice for Peace – Triangle had a wonderful banner expressing support to BlackLivesMatter, Palestine Liberation, Anti-Islamophobia and Queer Liberation movements. 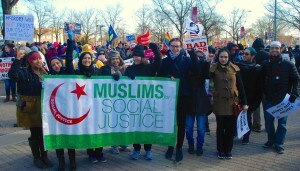 Jewish Voice for Peace – Triangle has organized canvassing against Islamophobia at Triangle-based businesses. For the past ten years, a fusion movement has been growing in North Carolina. 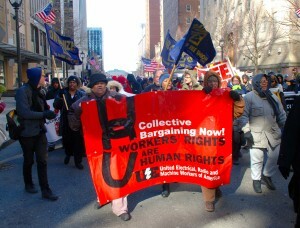 In 2006, the Historic Thousands on Jones St. (HKonJ) People’s Assembly Coalition was formed under the leadership of Rev. Dr. William J. Barber, II and the North Carolina NAACP. It has grown to include over 150 coalition partners. Each year this fusion movement comes together on the second Saturday in February to hold a mass people’s assembly to reaffirm its commitment to the 14 Point People’s Agenda and to hold lawmakers accountable to the people of North Carolina.